AutoZoneCares.com is the AutoZone Customer Satisfaction Survey website where customers can express their satisfaction about their shopping experience at AutoZone. AutoZone invites shoppers to participate in the survey and to reward them, they automatically enter them into the AutoZone Customer Satisfaction Survey Sweepstakes for a chance to win $10,000 cash. The AutoZone Customer Satisfaction Survey Sweepstakes is certainly one of the best AutoZone Sweepstakes along with the AutoZone Tax Time Giveaway at AutoZoneTaxTime.com, which may return during this year’s tax season. When you make a purchase at a participating AutoZone store, you might find an invitation to participate in the AutoZone Customer Satisfaction Survey on your AutoZone receipt. There are three ways to participate during the Promotion Period beginning on December 1st and ending on February 29th, 2016. 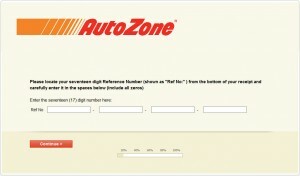 Visit autozonecares.com and enter the seventeen digit reference number printed at the bottom of your receipt. Follow the instructions to complete the survey in its entirety. Register for the sweepstakes by providing both your phone number and email address. Other personal information are optional. Call toll free 1-800-598-8943 and provide the reference number on your receipt. Follow the instructions to complete the telephone survey in its entirety. When prompted, say your telephone number, first name, last name and complete mailing address then press # to complete your entry. If you don’t want to make a purchase or did not find an invitation on your receipt, you may also enter by mail by sending a plain 3″ x 5″ card containing your first name, last name, complete mailing address, telephone number, date of birth and email address to “AutoZone CS Winter 16 Sweepstakes”, PO Box 10879, Rochester, New York 14610. Regardless of method of entry, only one entry per participants will be accepted during the entire Promotion Period. The AutoZone Customer Satisfaction Survey Sweepstakes is open to legal residents of the fifty (50) United States, District of Columbia and Puerto Rico (excluding residents of Hawaii and other offshore US territories and possessions) who are at least twenty-one (21) years of age or older as of the date of entry. excellent service,very helpful in finding things you need.